Before I begin telling this testimony of faith and of waiting upon the Lord, I would like to thank every one who prayed for me and this baby in Jesus' name. Back about a year or so now, I had asked for prayer for this baby from all my brothers and sisters in the Unleavened Bread Bible Study. My brothers and sisters there and here have been so faithful to stand in the gap on my behalf while the Lord was teaching me to trust Him. May this glorify the Lord in us all in the days to come. (Luk.1:45) "And blessed [is] she that believed; for there shall be a fulfillment of the things which have been spoken to her from the Lord". On January 8, 2004, I was awakened by the Spirit of the LORD and was made to know that I was going to have a baby. I had wanted one, I had been longing for one for some time, but I did not go to the LORD about it, sadly. Instead, I hoped that it would happen. Impatiently I waited. I had talked to my husband but he had said that it was not a good time, that we did not have enough money. But by then I was 31 and I felt like it was now or never. I had no idea what the LORD was about to do in my life. So I awoke, I was excited and scared. My first thought was, how am I going to tell Pete. (that's my husband). I was sure the LORD had told me. I had no doubt. Two weeks went by. I had not told my husband yet, thinking that he would not believe me anyway, but I was excited. Soon came the time for my cycle to begin. The time came and went. Years ago, me and my sister-in-law had dreamed that we would be pregnant at the same time. One day while we were sitting together during fellowship, she asked me if there was any chance that I was pregnant. I was surprised. I thought, "How'd she know?" But then she told me that she was sure that she was pregnant. Her and my brother had decided to have faith in the LORD about a better job for him so that they could have more children and she could be a wife at home. She believed that right after they agreed that, that night they became pregnant. (Mat.18:19) "Again I say unto you, that if two of you shall agree on earth as touching anything that they shall ask, it shall be done for them of my Father who is in heaven". I told her that, as a matter of fact, the LORD had woke me to tell me that I was with child two weeks before. She was excited and so we compared dates and discovered that we got pregnant on the same day. We were in awe. Another week went by and no cycle, then another, then another. Not that I expected it, but the thought of being pregnant was still fairly new and the habit of checking for the cycle was not. One day I was at Meijer and I thought I should get a test. Then I thought, "But the LORD told me I was; what do I need a test for?" Then I thought to talk to the LORD. I said, "LORD I don't want to go to man or man's ways and act as though I don't believe You, so I need You to give me a sign, a sign that helps me stand on what You already told me. So I pray that You let my license, as I flip it down the aisle, land face up, letting me know that I am as You said I was--with baby". Now, I was fully prepared to trust the LORD in this, no matter what it said. So I flipped it--and it landed heads up. I was thrilled! I finished my shopping, all the while thinking about the baby and the LORD and what He was doing. But when I got home, some time between the flip and the arrival home, I found doubt of some sort crept into me, and I said to the LORD, "LORD, please forgive me. I don't want to ask You again but I am struggling. Please give me one more sign that confirms what You have now told me twice". (Exo. 4:8) "And it shall come to pass, if they will not believe thee, neither hearken to the voice of the first sign, that they will believe the voice of the latter sign". So I stood in the hallway of my home and flipped some coins and asked, that if it is still the same as it had appeared to me till then, let the coins flip heads up. (Pro.18:18) "The lot causeth contentions to cease, And parteth between the mighty". They all flipped heads up. (Isa.46:11) "I have spoken, I will also bring it to pass; I have purposed, I will also do it". From that point on I was convinced, though my trial had only begun! Soon my sister-in-law was looking for a midwife and she found one who believed in Christ and had been catching babies for years; it was great.. I told my husband and he was excited. Well, into my second month I again was plagued, but not by doubt about being pregnant. Now I was plagued with fears that something was wrong with the baby because of my sin of not going to the LORD for this pregnancy but relying on myself and my ways of having a new little one. (Mar.4:40) "And he said unto them, Why are ye fearful? have ye not yet faith?" I felt like I had been dishonest to Pete, like I wanted a baby more than I wanted to listen to what he had decided. (Pro.16:9) "A man's heart deviseth his way; But Jehovah directeth his steps". Although this was not me or who I was any more, it was how I was acting at the time and my conscience was convicted and in utter fear. Finally, one day just after the turning of my second month, I was pressed down with guilt and fear. I asked the LORD if something was wrong with the baby. He said, "Yes". I asked Him if it was because of the sin on me. He said, "Yes". I asked Him if I had to confess this. He said, "Yes". I asked Him if I could confess it to my mom. He said, "No". I knew He was going to say no. I wanted to ask Him if I could confess it to my sister-in-law, but I knew that He would say no to that to because I knew I needed to confess it to Pete. So I asked Him, "Must I confess this sin to Pete?" Of course, He said, "Yes". In James 5:16 the Lord says, "Confess therefore your sins one to another, and pray one for another, that ye may be healed". I was even more scared now; to say to my husband that I had not cared what he wanted was frightening to me. I was 55 minutes away from home and needed to tell him as soon as I arrived. The drive home was hard and got harder the closer I got to home, but I arrived and did not wait to begin. I knew it would take me some time to actually get it out of my mouth. By the time I got home, I felt like I could cry, but I made myself not, telling myself that I was not going to cry because it might make my husband have compassion for me because I had not been truthful and now am facing the consequences. So I said to him, "Pete, I need to tell you something". I tried for what seemed like forever to say it but I kept looking for ways to break it to him easy, but there were no easy ways to be found. So, finally, I said it. To my surprise, to my complete surprise, my husband bent over me and kissed me on the head and said, "What's done is done". Strangely, I was frustrated, quietly uneasy; I felt like I needed to suffer more for how I had been, for what I had done. The LORD was merciful through my husband that day. So after a few days, because I was new to faith and the ways of GOD, I felt like I should ask my husband to lay his hands on my belly and bless the baby because he had forgiven me. My faith I felt was not sufficient to believe that all was well, but my husband would not. He had a hard time with faith, too. So I mustered up the courage to go to the LORD and asked Him to honor my prayer prayed according to His word. (Mar.11:24) "Therefore I say unto you, All things whatsoever ye pray and ask for, believe that ye receive them, and ye shall have them". So I placed my hands on my tummy and prayed that Spirit of life and health come into this little one. (Rom.4:17) "God, who giveth life to the dead, and calleth the things that are not, as though they were". Afterward I asked the LORD to give me a sign from the Bible to stand on, that my faith would be strengthened, and I opened my Bible and this is what I put my finger on: (John 16:21) "A woman when she is in travail hath sorrow, because her hour is come: but when she is delivered of the child, she remembereth no more the anguish, for joy that a man is born into the world". I was astounded and thankful and joyous and renewed. I believed again. (Heb.11:1) "Now faith is assurance of [things] hoped for, a conviction of things not seen". Over the next nine months, my sister-in-law and I grew in all ways the same, each with our baby inside. I enjoyed all the new and strange sensations happening in my body, and it was awesome to call up my sister and to hear how she was having them all, too. It was like we were in our own little baby world. But at the same time I went in and out of faith. Although the baby moved and I grew and my belly stretched and I gained weight, the struggle in my flesh was intense. Oftentimes, just to try somehow to escape the things in my mind, the fears, the thoughts, all the "what ifs", I would ask the Lord questions by lot. One night things were so hard, I don't remember how it started, all I know is that I couldn't fight it. I ended up asking the Lord questions I already knew the answers to, but in doubt from fear and the enemy, I could not resist. God taught me much; this night was a hard lesson. I don't quite remember well everything thought or asked, but basically this is what I do remember. I was past the laying on of my hands on my belly, I was trying to stand on the sign given to me in John 16:21, but being still very young in the Word in and in the Faith, I was just learning how to fight. I didn't yet know how to need His mercy so often. I didn't yet know how to constantly believe Him. As I began asking questions, He would answer quite faithfully, reminding me in my weakness what He had already said was done. In my doubt I asked MANY "what ifs", only to discover that He began answering me according to what I was believing. I didn't see that that is what it was -- yet. Afraid and lacking faith and confused, I called my sister in the Lord, crying. Many times the Lord has helped me though those who are trusting Him when I am struggling, too. She reminded me what He had said to me before, and told me that He longs for us to believe Him, no matter what it feels like, looks like, or sounds like. She reminded me of the Scriptures that tell of a man of God who was told (1Ki.13:9) "[F]or so was it charged me by the word of Jehovah, saying, Thou shalt eat no bread, nor drink water, neither return by the way that thou camest". But he went back with a prophet that said (1 Kings 13:18 "[A]n angel spake unto me by the word of Jehovah, saying, Bring him back with thee into thy house, that he may eat bread and drink water. [But] he lied unto him". (19) So he went back with him and did eat bread in his house, and drank water". So because of his disobedience or unbelief of the Lord, he perished. A fear of our Father came over me and I repented for asking Him these questions in disbelief of Him, and He renewed my faith in His word. At the end of my third month I began going to visit the midwife that my sister-in-law had found. So I was getting prenatals and advice from her about the baby and the pregnancy. One night, we went to the midwife's house for a Bible study, and she asked me and my sister to give our testimony about how we had been delivered from witchcraft and as the night when on I found myself giving my testimony about the little one growing within me. My flesh resisted for fear of looking silly but it had no chance against the Spirit of the LORD, who strengthened and encouraged me to tell this to the group. For this group it was a strange thing to hear and it was reflected on their faces. But I was filled with faith. (Heb.12:1) "Therefore let us also, seeing we are compassed about with so great a cloud of witnesses, lay aside every weight, and the sin which doth so easily beset us, and let us run with patience the race that is set before us". Interestingly, my midwife shared with me and Jenni a story about a woman who was living, I think, in China, and was in hiding because she was pregnant with a baby girl. She was a Christian and she asked the Lord to keep her pregnant till she could get to some place safe. Not sure where she made it to, but Chantel told us that she remained pregnant for 13 months and delivered a health baby. She said this was a miracle because after a month of being overdue, it is said that the baby will not get enough oxygen because the placenta will begin to fail. And this testimony came even before any of us could have known what the Lord was going to do. During my first prenatal, my midwife found the heartbeat of the baby briefly. But by this time I could tell that my testimony was working some doubt in her, and it was hard for both her and I to bear it, now. My sister and I left, and I went home feeling like I didn't want to go back. I just wanted to believe the LORD and not listen to the disbelief of others. In my fourth month, I went again to a prenatal, and this time she could not find the baby's heartbeat. And for a month, the way I felt when I was near her was heavy on me and working nothing good in me. (1Pe.1:7) "[T]hat the proof of your faith, [being] more precious than gold that perisheth though it is proved by fire, may be found unto praise and glory and honor at the revelation of Jesus Christ". On the way home from the fourth-month visit, I talked to my sister, and she shared with me what she saw the LORD doing and I could see it. I became excited for my midwife, who was also having her faith tested and tried. I could see what was happening once again for a short time. I began talking to my midwife on the phone as friends. She shared with me how the LORD had showed her in a dream three or five years before that she was going to have three more babies, and that since that time, her and her husband had been trying without any success. I confided in her that if she would go to the LORD and believe that He would do what she asked Him to do, what, in fact, He said was already done in her dream, that He would do it. She said to me that she was afraid of going to the LORD for fear of what He would say to her, 'cause she really wanted a baby. I could tell that she wanted to believe my testimony, but also struggled. Her and her husband had been going to a fertility clinic to see if they could increase their chances of conceiving. For years, she took a medication that was supposed to make her get pregnant, but it did not. I reminded her that all good things come down from heaven and no matter how much we want something, we can't get it from nowhere but from GOD. She agreed, sounding sadly like she thought that GOD had forgotten her. Then some time passed. Another prenatal came, and this time she could not hear the heartbeat again. She was discouraged because I was convinced that the Lord would bring what He said was done. (Isa.66:9) "Shall I bring to the birth, and not cause to bring forth? saith Jehovah: shall I that cause to bring forth shut [the womb]? saith thy God". Again I went home, my flesh not wanting to return, it forgetting that GOD was in control and had good reason for all that was happening. I was blinded by it too often. I was slowly going into depression. During my fourth month, I began feeling the little one move within me so strong that often I believed that it alone was keeping me from doubting altogether that I was pregnant. I was faithful in the fear of the Lord at my prenatals. (Psa.111:10) "The fear of Jehovah is the beginning of wisdom". My midwife would use her baby heart finder and I was determined to only speak and agree with the LORD, knowing that I stand before Him and not before man. (Jer.17:5) "Thus saith Jehovah: Cursed is the man that trusteth in man, and maketh flesh his arm, and whose heart departeth from Jehovah". (2Co.4:18) "[W]hile we look not at the things which are seen, but at the things which are not seen: for the things which are seen are temporal; but the things which are not seen are eternal". So, at my fifth prenatal, things were uneasy. It came and went with almost no words but a lot of tension. As she was again looking and looking for the baby's heartbeat, the baby was kicking up a storm in there. I could feel more than could be seen, but oftentimes you could see my belly bump up and down in different places. Once, during the checking for the heartbeat, in all her frustration with me not agreeing with her equipment that there was no heartbeat to be found, the baby kicked the Doppler. Not only could you hear the sound of the kick, you could see the Doppler bump up. She looked down at my belly, confused. There it was, the sign for her. She appeared to quickly brush it off, but to my brother and sister-in-law who were there with me, the look on her face was clear acknowledgement of something not understood by her. I was excited. I thought maybe now she can believe. The end of the fifth month had been less challenging. The baby was moving; the midwife saw and heard him move. I was thankful for the rest that my mind had for those brief days, but I had no idea what was to come. During my sixth-month prenatal visit, the Doppler told the same old story. On top of that, she also could not find the top of what is called the fundus, the top of my womb. It seems that the LORD did hide things from her. But just days before, my two sisters-in-law had had me lay on the floor to feel the baby and they located my fundus right away, right where it was supposed to be. My midwife must have been so frustrated because I believed GOD and would not accept what was apparent to her. After she had finished checking me out she sat down and said to me, "Do you think that GOD could have lied to you so that you would stop protecting yourself from getting pregnant so that He could then get you pregnant?" I heard what she said but didn't comprehend what she had said right away. My sister-in-law laughed. She was immediately aware of what the midwife had suggested. Then it hit me and I said to her, "Did you just ask me if the LORD lied to me?" (2Co.4:13) "But having the same spirit of faith, according to that which is written, I believed, and therefore did I speak; we also believe, and therefore also we speak". I said to her the Bible says that He cannot lie: (Psa.119:89) "For ever, O Jehovah, Thy word is settled in heaven". (Psa.89:34) "My covenant will I not break, Nor alter the thing that is gone out of my lips". (Heb.6:18) "[I]t is impossible for God to lie". And that I walk by faith and not by sight. If the LORD said it, then He meant it, no matter what we can see. (2Co.5:7) "[F]or we walk by faith, not by sight". She said, "Ooookay", with a sigh, then soon after, we left. We knew that this was trying her faith, as well as mine and everyone else who knew. (Jas.1:3) "[K]nowing that the proving of your faith worketh patience. (4) And let patience have [its] perfect work, that ye may be perfect and entire, lacking in nothing". The confession I had given her seemed to quicken me. (Mat.10:32) "Every one therefore who shall confess me (speak the same as me)before men, him will I also confess (speak the same) before my Father who is in heaven. (33) But whosoever shall deny me before men, him will I also deny before my Father who is in heaven". (Heb.10:23) "[L]et us hold fast the confession of our hope that it waver not; for he is faithful that promised". (Rom.1:17) "But the righteous shall live by faith". (Rom.10:10) "[F]or with the heart man believeth unto righteousness; and with the mouth confession is made unto salvation". I was clearly thinking and aware that it was not I that lived but that Christ lived in me and I was not my own. (Gal.2:20) "I have been crucified with Christ; and it is no longer I that live, but Christ liveth in me: and that [life] which I now live in the flesh I live in faith, [the faith] which is in the Son of God, who loved me, and gave himself up for me". I had struggled with double-mindedness -- (Jas.4:7) "Be subject therefore unto God; but resist the devil, and he will flee from you. (8) Draw nigh to God, and he will draw nigh to you. Cleanse your hands, ye sinners; and purify your hearts, ye doubleminded. (9) Be afflicted, and mourn, and weep: let your laughter be turned to mourning, and your joy to heaviness. (10) Humble yourselves in the sight of the Lord, and he shall exalt you". -- tempted often to believe man to make it easier on me, but I loved Him and I did believe Him, even when things from all directions would come to try to convince me otherwise. (Luk.7:47) "Wherefore I say unto thee, Her sins, which are many, are forgiven; for she loved much: but to whom little is forgiven, [the same] loveth little". Days later, I was going about my day when the thought passed me that Chantel (my midwife) was going to call and tell me that she could not be my midwife any more. Right after the thought, the phone rang. I came rushing out of the bedroom, saying, "It's my midwife; I got it". I answered and there she was, saying exactly what I had heard. The brief heads-up from the LORD was just enough for me to be prepared in Him to talk to her. So I said to her, "Okay, but can I call you when I go into labor? She laughed out loud, and sounding baffled, said, "Yes". So now I was without a midwife. I hoped it would go over well with my husband. When I told him, it was a relief to him at least that she said that we could call her. He was kind of upset with her because he felt like she must not be a very good midwife if she could not tell that I was with baby at six months. I knew that she was good at what she did, but the LORD wanted her and I both to become good at trusting in Him. The next three months were busy and exciting. I shared this with my bother Phillip and my sister Niki before Niki left to go to Dakota to visit her family. I could tell that although my faith in these moments was stronger than it had been, I could feel doubt coming from them. Not intentional, for they both were trying to believe that I was pregnant, even though my midwife was kept from being able to prove it with man's ways. More my brother, than my sister, at this time because my sister had felt the little one kick before she left. Then we went camping in August and prepared for the little one to be here. I thought of baby names. My husband wanted a common name and we did not know if it was going to a boy or a girl. I found name after name; he did not like any of them. Then one day he said to me, I have a name for a boy but I don't want to tell you what it is. So weeks went by and one day he told me. Joshua David was what my husband had chosen, knowing others by this name. I was surprised that he chose it and the neatest thing to me was that He didn't even know what this name meant or that it was our Lord's name translated into our language. One day we found online at a midwifery site a testimony of Chantel's. It went like this. "The LORD told me that I was going to have more children. My husband and I have been trying for years. We began to go to fertility treatments with no success. One day we went and the doctor suggested removing my eggs and fertilizing them and then selecting the one that we wanted and discarding the rest. My husband took me aside and said, 'How far are we going to take this? Do you want a baby so bad that you would kill some of your children to have one?' She said she cried and said to him, 'Whatever you decide, that I will abide in no matter what it is'. He said to her, 'I think the LORD will do it the old fashioned way'. That night they went home and got pregnant -- hallelujah! I was so happy for her. And by the faith of her husband did their son Israel David come to be among us. Pete and I were growing in anticipation. It was October now and the little one would soon be here, and my sister-in-law's, as well. Soon the news came. Jeni had had her baby, Zayne Zipporiah Daniel Burns. I was so excited. For weeks I had been having false labor. I knew my time was right around the corner. Within a week my contractions came; I went to my mom's and they kept coming. Then they stopped. Days later they began again, very strong. On this day my sister-in-law and brother took me to Chantel's to see if she could check and see if I had begun to dilate. She agreed to see me. As we arrived, I fought the thoughts in my head and went in. (2Co.10:4) "([F]or the weapons of our warfare are not of the flesh, but mighty before God to the casting down of strongholds), (5) casting down imaginations, and every high thing that is exalted against the knowledge of God, and bringing every thought into captivity to the obedience of Christ". She checked me. This time she found my fundus. She was surprised and when she checked me found that I was dilated to two. Again she looked confused. I thanked her and left. But the contractions stopped again. This time they stopped and it seemed like they stopped for good. (Luk. 12:48) "And to whomsoever much is given, of him shall much be required". I left my mom's house and went home. At home my thoughts were burdening and I found that I could not fight them. (1Ch.28:9) "[F]or Jehovah searcheth all hearts, and understandeth all the imaginations of the thoughts. If thou seek him, he will be found of thee". The storm of intrusive thoughts was unrelenting. Thoughts such as, "See, you're not pregnant; there's just something wrong with you", or, "Your baby's dead, that's why your labor has stopped", etc. As weeks went by, I was losing hope. The baby moved within but it almost never seemed to be enough to hush the thoughts of, "What will people think?" I often heard, "People will think you are a liar". (Rom.3:4) "God forbid: yea, let God be found true, but every man a liar; as it is written, That thou mightest be justified (accounted righteous) in thy words, And mightest prevail when thou comest into judgment". I knew how to fight these words. I knew the promises to stand on. I knew that the world calls faith a lie. I knew--but I was weak. (2Co.12:9) "[My] power is made perfect in weakness". I could not fellowship. I could not see others with out crying. I could not talk. I was in a darkness and I felt like the LORD had forgotten me. I could not ask for prayer. I was so far away that at times I did not think anything or anyone could help. My brethren just thought that I was not fellowshipping 'cause I was miserably pregnant. I grew sick. I began coughing and wheezing. For weeks I was in bed, just sleeping. It was the only way to escape the thoughts and voices that plagued me, I thought. I tried to tell my husband. He was so very patient, but telling him did not help me feel better, or so it seemed to me. Two-and-a-half months went by and I did not fellowship. (1Co.1:27) "[B]ut God chose the foolish things of the world, that he might put to shame them that are wise; and God chose the weak things of the world, that he might put to shame the things that are strong; (28) and the base things of the world, and the things that are despised, did God choose, [yea] and the things that are not, that he might bring to nought the things that are: (29) that no flesh should glory before God. Then my sisters began to come to my house, right into my room, and sat on my bed and fellowshipped with me. I told them honestly that I did not want them there. They said they knew but it did not matter; what I need and what I want are two different things. They came three times, and as the third month came for me to be what I thought was over due, I was very sick. So one day my husband said to me, "Leisa, have you noticed that since you stopped fellowshipping that you have been sick, and that every time you use being sick as an excuse to not fellowship, you get more sick?" I knew, as in times before, that the LORD had come and spoke to me though my husband the very words that would convict my conscience of what was right, and I did not like it. I was being comfortable--my sickness and depression was more comfortable then facing any of the possibilities that the intrusive thoughts had suggested. I really needed help. But I love the LORD, so I in my conscience went to my mom's house to fellowship. Then in the car on the way there, the LORD spoke to me as I was singing to HIM. He spoke to me in my thoughts. He said, "Be it done unto you according to your faith; this is what has been happening with you and your brother". And .I was filled with faith and strengthened. (Php.4:13) "I can do all things in him that strengtheneth me". (Mat.17:20) "And he saith unto them, Because of your little faith: for verily I say unto you, If ye have faith as a grain of mustard seed, ye shall say unto this mountain, Remove hence to yonder place; and it shall remove; and nothing shall be impossible unto you". (Mat.8:13) "And Jesus said unto the centurion, Go thy way; as thou hast believed, [so] be it done unto thee". (Mat.9:22) "But Jesus turning and seeing her said, Daughter, be of good cheer; thy faith hath made thee whole". (Mat.9:29) "Then touched he their eyes, saying, According to your faith be it done unto you". During my twelfth month I had a dream that was like one that I had in my third month. In my third month I dreamed that I was having the baby. I was at the end of my bed on the floor and my midwife was there to catch. My husband was in the bed but he left the room. I had the baby. It was a girl. While my midwife sat on the bed with the girl, on the floor was a baby boy. But it was an egg, and my midwife said to me, "Let's put this one back for later". Then, later in my twelfth month, I dreamed again that I was at the end of my bed having the baby, only this time my husband was catching and I had a boy. When I spoke to my sister on the phone, the Lord gave to us a revelation of what the dreams meant. Since the bearing of a child represents bearing fruit, the bearing of a boy child represents the Man child or the fruit of Christ. Through the knowledge the Lord has given us to see on these dreams, He showed us that if I were to of had the child in the natural time, I would have not bore the fruit of Christ: the patience and longsuffering, the faith, and death of my old man. He truly is amazing and faithful to His children to provide the perfect opportunities for bearing good fruit! My brother Dan was also dealing with faith and trusting in the LORD for answered prayer that was not yet seen. All of sudden I could see it--faith is faith--whatever you're believing, that is what will be done unto you. Suddenly the 12 months became clear to me. I had been double-minded, unwittingly. I believed the LORD but sometimes acted as if I didn't, out of fear mostly. I was getting a lesson in faith, not only how to have it but how to walk it. I often felt foolish but determined, scared but excited. To the world I sometimes looked crazy but to the LORD in those times I looked righteous because I believed Him. (Gal.3:6) "Even as Abraham believed God, and it was reckoned unto him for righteousness". To the LORD I sometimes looked like a frightened child that wanted to trust Him completely but was just learning how. I was overwhelmed that day driving down the road, and suddenly I realized that I was healed! I was no longer sick. When I got to my mom's, I told them about what the LORD had said to me and they were excited. (Luk.22:31) "Simon, Simon, behold, Satan asked to have you, that he might sift you as wheat: (32) but I made supplication for thee, that thy faith fail not; and do thou, when once thou hast turned again, establish thy brethren". Phone calls started poring in at the homes of those believing with me, not many called me though. After the expected due date, I appeared to stop gaining weight. The baby moved about the same as before, as happy as could be within me. I was content in the LORD finally. Sometimes some fears would rise up in me, but not as before. These fears came as a, "What will I say to those who cannot understand faith?" I had no idea, so I gave it to the LORD and He always either gave them ears to hear or peace about the whole thing. It was amazing watching Him work everywhere. Truly blessings abounded, even in unbelievers. Day by day I walked with the LORD. Sometimes He would tell me things that would make things more clear. As time went by He was always there as I trusted Him to prepare me before the storms. One day, as I was cleaning the house, He said to me, "No one knows the day or the hour". It caused me to think about how many people were waiting and wondering, waiting for this baby to be born or wondering if it ever would be, much like the coming of Christ. People waiting for Him to come and others wondering if He really will. It was an awesome thing. My sister Niki returned from Dakota around my twelfth or thirteenth month, I forget, but when she returned she was shocked that I did not have the baby yet. I could hear the doubt in her voice as I talked with my brother on the phone. I swallowed my frustration and gave her and my brother my love then went to visit them. When I got there, I was surprised. Between the phone call and the moment I arrived to their home, they had been filled with faith. My brother Phil said to me things like, "Who's to say how long a person can be pregnant?" Phil often would hear the people at work talking about how I must not really have been pregnant way back then, or that I just must have been really wrong about the date we thought it was supposed to be. Phil quite faithfully stood in the gap and said to them, "All things are possible in Christ", and showed himself to be content and faithful to believe the Lord as well, despite how crazy it made him look to others. It seemed to me that His faith helped his wife's faith about it, too, and when they saw me I could feel not only the awe for the Lord and His work, but their faith in the miracle inside me. This is the interesting twist. Niki got pregnant while I was pregnant. I was thought to be due in October on the 8th of 2004 and she was thought to be due in March 2005. I was pregnant before she was and pregnant still after she had her baby. And still Niki's faith remained strong. Also, my sister Jenni, who became pregnant on the same day as me, was said to be due October 8th as well. She gave birth to her daughter in October 2004 and then became pregnant again six weeks later and is now just ten weeks after my baby was born. She is overdue to have her new one. God is awesome. Here in my thirteenth or fourteenth month, my Roy was really worrying. He wanted me to go to the doctor and, with tears in his eyes, he said to me that he did not want to lose me. I looked up to him and said, "Roy, I am not my own. I was bought with a price, and this baby is of the LORD and it's not for me to say what should or should not be done. I believe GOD, and GOD said to me, (Joh.16:21) "A woman when she is in travail hath sorrow, because her hour is come: but when she is delivered of the child, she remembereth no more the anguish, for the joy that a man is born into the world". (Luk.1:45) "And blessed [is] she that believed; for there shall be a fulfillment of the things which have been spoken to her from the Lord". I said to him, "God said that this baby would be born, and that I was not of this world but of heaven, and the natural laws of this world do not apply to those who believe the Creator and abide in Him". He hugged me and then we all watched the faith of GOD grow in him; it was awesome. One day we were going to have a family barbecue. My sisters that I had not seen since before I thought that I was due in October were going to be there. I talked to Pete (my husband) and told him that I was having a problem. I wanted to see my sisters and I wanted to go to the barbecue, but I did not know what I was going to say to them. My husband said to me, "Well, you know that you could not have been pregnant this whole time". I said to him, "I know that we don't talk about this kind of stuff offended and it is not my will that you should believe what I believe. But I know what the LORD told me and I have to and I want to stand before Him and not man". When I am face-to-face with Him, I don't want the shame of having not believed Him when He has always been faithful to me. So then my husband said to me, "Well, then just tell that we are saving for college by not having to buy diapers". We both laughed and ever since then he would always joke about how he was going to name the baby Slow Poke for making us wait so long to meet him. Again we ALL watched the faith of GOD grow in this man, as well. Hallelujah! So I went to the barbecue in faith, and when I arrived every one who had not seen me had peace upon them. They asked me how overdue I was. I told what it seemed like and they had no reservations other than I must be miserable. Everyone took turns feeling the baby move and watching my belly move with the playful one inside. It was a great day. Sometimes I see how silly I am after I see what the LORD can do. In my sixteenth month I had been for months praying that the Lord would send chastening to me for some sin that I had gotten into. I had been struggling with a sin that I myself had been trying to defeat until the Lord reminded me that I could not myself stop the sin that was in my flesh, and that I could do nothing without Him but could do all things in Him. So I stopped trying to stand up against this sin myself and asked the Lord to bring judgment on my flesh and to teach me by example how to take dominion over this land. Finally the correction came. At first I did not know that that is what it was. I had developed shingles, and I was miserable. It was all down the left half of my face and it spread into my eye. My face looked like it had been severely burned. Now in the past, I had had a problem with looking things up on the computer and getting information that I really did not need in the Lord, with all kinds of things pertaining to my pregnancy because of my fears. Apparently, I had not learned my lesson. My face itched and burned. The Lord had informed me that this was an answer to my prayer. Truly I was thankful and excited, but after some time had passed, the misery of it became what I thought was unbearable. I began to look up on the computer my symptoms to see what it was that I had. I found it, then I read about it. I began to reason that I had suffered and now I was ready to have some relief. This is what I found out. Shingles is like herpes. It is incurable. It is spread from person to person. Yet I knew no one and had no contact with any one who had it. It takes three to seven weeks to clear up IF you go to the doctor for meds. If it gets into your eye, it has a 98% chance of causing you to go blind. If you get it in the latter part of your pregnancy and the sores are open when you deliver, you won't have built up antibodies for the little one to have and the baby has a high chance of being born with serious health problems or even death. Now here comes a side trial. I was trying not to be worried. I did not want to tell my husband all the things that I found because I thought he might make me go to the doctor. I figured that if I was not going to have faith, I may need to go, but I wanted to have faith and I was miserable at the same time. I was not sleeping at all; the pain and itching was too intense. The sin I was in this mess of was certainly turned away from me but now because I found out that there is no cure, I felt like the Lord would not mind if I relieved myself some in order to sleep constantly. I was looking on line for something to help me. You're not going to believe what I found, too; here goes. I found that vitamin C helped something and some other something like it helped something else. I reasoned vitamin C comes from oranges, I eat oranges. And the other thing comes from green veggies. I eat those, too; just not enough to get out of them all that I would need to have the relief I want from this. So I got some and I took some. Somehow the swallowing of these pills did not seem to wake me up since it has been around five years since I have taken any kind of pill. But I did. I kept thinking if I have open sores on my body when this baby is born, something bad could happen, as if the Lord was not in control. I tell ya, my mind was in some kind of place. Anyway, one night after suffering for around six days, I was on the computer and the Lord brought to my remembrance all of a sudden "Pharmakia". I WAS SCARED. I used to be a witch; I knew what that was and now I was in it. If I had thought before that this disease that I had had was some how going to hurt this baby, disregarding what the pills I was taking was going to do and forgetting that the Lord knew I would do all of this, now my conscience was in full swing and aware of what I had been doing, stripped of all the reasoning and justification. I went right to my knees talking to the Lord, crying out to Him like I needed to be doing all along. So I prayed. I said to Him that I was sorry that I did not come to Him, that I had sought my own works to save myself from discomfort, forgetting that He was the God of all comfort. I prayed to Him telling Him that corrective infirmity was so difficult to bear and remembered at the same time that it was what I prayed for and was thankful for. It helped me to see that I would have to turn to Him when I was week. So in my now increased weakness and tears I asked Him to heal me, forgiving me for my sin. I believed. I knew that in confessing my sin and repenting of it, He was faithful to forgive me and to heal me. So I said to Him, "Father, I pray that You confirm Your promise in and show me in Your word that I am healed; that I may, no matter what I see, stand on what You have done. I opened my Bible and this is what my finger fell upon. (Jer.30:14) "All thy lovers have forgotten thee; they seek thee not: for I have wounded thee with the wound of an enemy, with the chastisement of a cruel one, for the greatness of thine iniquity; because thy sins were increased. (15) Why criest thou for thy hurt? thy pain is incurable: for the greatness of thine iniquity, because thy sins were increased, I have done these things unto thee. (16) Therefore all they that devour thee shall be devoured; and all thine adversaries, every one of them, shall go into captivity; and they that despoil thee shall be a spoil, and all that prey upon thee will I give for a prey. (17) For I will restore health unto thee, and I will heal thee of thy wounds, saith Jehovah". Needless to say, I was healed. The next day I woke up and it was much better, the redness in my face was abated and not itching or burning. It had only been one week not three or seven and no doctors. Although I took pills, there was no cure for what I had and only the Lord could have removed it just as fast as He had given it because He uses all things together for our good. (Lam.3:25) "Jehovah is good unto them that wait for him, to the soul that seeketh him. (26) It is good that a man should hope and quietly wait for the salvation of Jehovah". -- and I knew that I had to confess my impatience. Once I did, I saw and remembered that no one knows the day or hour. I guess I had forgotten that GOD was in control. In my eighteenth month, on Sunday the 10th of July, contractions came. My husband checked me and I was dilated to 5 and the plug of my womb had come out. My sisters and my mothers came. For six or so hours I was in labor. The labor was hard and steady. As the hours went by, one of my sisters began to read to me a book called Hinds' Feet on High Places. As she read, my contractions slowed AGAIN to nothing, then they were gone. I had felt the baby move down very low and lodge in my pelvis, but everyone went home except for my mother-in-law, who stayed till the next Friday and then had to go home. It was a very long week. Then my mom came to stay with me. The next day, my sister-in-law came over and her and my mom and I went to Meijer. On the way back home, my water broke in her car. I was in disbelief. It was happening! I was scared and somehow felt like I was not ready, but the time had come just like the Lord had promised. Labor began and what I thought was hard before was nothing. The pangs came harder and harder, lasting longer and longer and coming faster and faster. My pain was so intense that I could not talk, I could not think. I could do nothing but hope to get though each one as it came. (Isa.26:17) "Like as a woman with child, that draweth near the time of her delivery, is in pain and crieth out in her pangs; so have we been before thee, O Jehovah. (18) We have been with child, we have been in pain, we have as it were brought forth wind; we have not wrought any deliverance in the earth; neither have the inhabitants of the world fallen". My brethren there with me would ask me questions, but I couldn't reply; it was like I was not really there. In the beginning the pangs were hard but nothing compared to how it would get. .I kept thinking, "Who can endure?" (Mat.24:13) "But he that endureth to the end, the same shall be saved". (2Ti.2:10) "Therefore I endure all things for the elect's sake, that they also may obtain the salvation which is in Christ Jesus with eternal glory". Who will be able to remain unto the end when the tribulation of the saints, that is likened to the travail of a woman, comes? (1Th.5:3) "When they are saying, Peace and safety, then sudden destruction cometh upon them, as travail upon a woman with child; and they shall in no wise escape". I saw in my travail a vision of some saints going into darkness, forgetting to cry out to the LORD, not knowing how to trust him, just wanting the pain to end, being tempted by man and thoughts to seek relief outside of the LORD. The pain was all there was, nothing else could be seen. I saw this before my pain got bad. (Joh.16:21) "A woman when she is in travail hath sorrow, because her hour is come: but when she is delivered of the child, she remembereth no more the anguish, for joy that a man is born into the world". At moments I thought I would die; I thought it would not end. I had no sense of anything or anyone: only pain, only suffering, only agony. All my brethren stood around me. Some were excited though and longed to deliver me. All were in prayer, some were scared, some were worried. They all comforted each other in faith. None could comfort me. Sometime after ten, I began to push. After pushing for about 3-1/2 hours, Pete checked to see if he could feel the baby down low. To his surprise, he could feel my cervix again and told me. I suddenly was frightened. In the moments between my contraction, I cried out for Jenni, my sister, to come to talk to me. I said to her, "Say something to me, say something...he felt my cervix...say something". I couldn't say much more through four contractions. I got that much out, but she understood. She said to me, "Leisa, it's okay, the LORD is in control. Don't walk by sight, walk by faith. He can overcome anything. Don't worry about what things seem to be; just do what you need to do and the LORD will take care of the rest". (Psa.34:17) "[The righteous] cried, and Jehovah heard, And delivered them out of all their troubles. (18) Jehovah is nigh unto them that are of a broken heart, and saveth such as are of a contrite spirit. (19) Many are the afflictions of the righteous; but Jehovah delivereth him out of them all". After I prayed, I got out of the tub and had needed to sit, still pushing. Something began to happen. I felt a burning...a deep burning...torturous yet welcome, burning. I knew, though I had never felt anything like it before, that the baby was coming down. Every contraction that came, I fought. I don't want to push...it's too painful--I want to push, the baby is coming. I would struggle each time and overcome and push, and found that each time I overcame, strength came into me and I was giving thanks, every minute I was thankful. (Php.4:4) "Rejoice in the Lord always: again I will say, Rejoice". (Eph.5:20) "[G]iving thanks always for all things in the name of our Lord Jesus Christ to God, even the Father". I felt the LORD with me. Then, suddenly, I felt the baby's head crown. My mother called my husband and he came quick into the bathroom, opened the shower door, and said to me, "Leisa, push!" I did, and the baby was delivered into the arms of his dad. As Joshua's dad held him, at first he did not breathe, but there was no fear in my husband. With confidence and love, he held him and patiently helped him to breathe. Moments passed and my mom called my sister. My sister said to tell the baby to breathe in the name of Jesus. My mom told my mother-in-law and she commanded the baby to breathe in Jesus' name. He breathed. (Joh.14:12) "Verily, verily, I say unto you, He that believeth on me, the works that I do shall he do also; and greater [works] than these shall he do; because I go unto the Father. (13) And whatsoever ye shall ask in my name, that will I do, that the Father may be glorified in the Son". Then I took my son into my arms, and him and I took a bath, and rested. (Heb.4:3) "For we who have believed do enter into that rest". (Joh.11:40) "Jesus saith unto her, Said I not unto thee, that, if thou believedst, thou shouldest see the glory of God?" Three days later, as I was resting in bed, the Lord laid on my mind these things, signs of a perfect deliverance of the LORD, that we can rest in HIM, and I'm sure is a shadow of things to come. (Gen.8:4) "And the ark rested in the seventh month, on the seventeenth day of the month, upon the mountains of Ararat". Not sure yet what the meaning is, but it is only two times that the seventeenth day is mentioned and the only time that the seventh month and seventeenth day is mentioned at the same time. 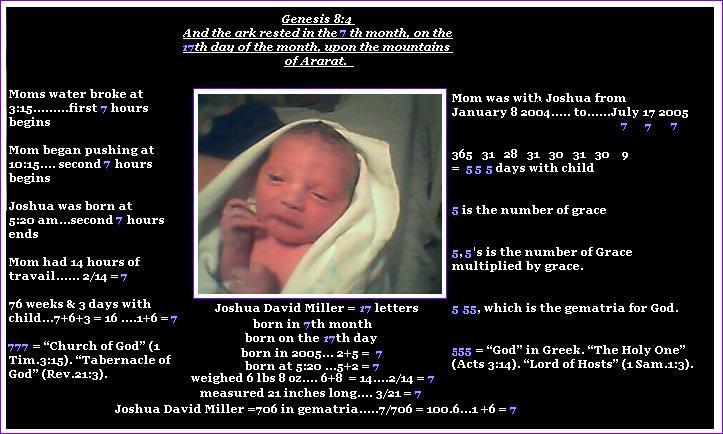 Joshua was born in the 7th month on the 17th day in 2005...2+5 = 7. He was the 7th person in the house that night. 777 = "Church of God" (1 Tim.3:15). "Tabernacle of God" (Rev.21:3). 5, 5s is the number of Grace multiplied by Grace. 555 is the gematria for God. (Rom.1:17) "The righteous shall live by faith", for we have nothing that we did not receive from Him. (1Co.4:7) "For who maketh thee to differ? and what hast thou that thou didst not receive? but if thou didst receive it, why dost thou glory as if thou hadst not received it?" I thank the Lord for all that He has taught us. (Luk.13:4) "Or those eighteen, upon whom the tower in Siloam fell, and killed them, think ye that they were offenders above all the men that dwelt in Jerusalem? (5) I tell you, Nay: but, except ye repent, ye shall all likewise perish". (Luk.13:11) "And behold, a woman that had a spirit of infirmity eighteen years; and she was bowed together, and could in no wise lift herself up. (12) And when Jesus saw her, he called her, and said to her, Woman, thou art loosed from thine infirmity". Jenni asked if she knew what they meant but my mom only could figure that it had something to do with the number 18 since the number was present in both. Then the Lord showed Jenni what it meant. In Luke13:4, it shows that there will be destruction on those who do not repent. If you noticed in the letter, the last part of Luke 13:5 is quoted. Except we repent, we will likewise perish. In Lk.13:11, it shows that there will be a deliverance in the Church, not of sickness of body but from the curse and burden. Both of these in Luke and both of the 18-month pregnancies show this exactly: the child of destruction; the child of deliverance.